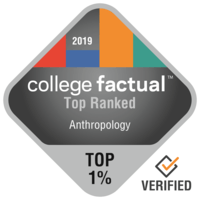 2019 Best Anthropology Colleges in the U.S.
Only 9,242 students earn a degree in Anthropology each year, which means it is ranked only 53rd out of 384 in appeal. If you are concerned about post college income, choosing Anthropology is probably not the best option for you. It is ranked 89 out of 121 college majors for earning potential, yet, several colleges might offer improved opportunities than others, and students can enhance their money making potential with additional education. Learn about the top ranked colleges and universities for Anthropology majors. Some of the factors included in the ranking methodology include education quality, average earnings of graduates, accreditation, and more. If you're looking for the best education available in Anthropology you simply can't do better than Washington University in St Louis. Students who graduate from this program report average early career income of $41,079 and mid-career income of $67,470. Washington University in St Louis is located in the suburban region of Saint Louis, Missouri, near to shops and other entertainment. This institution understands how to handle the specific needs of international students, since 8.1% of its undergraduate population comes from outside the United States. With 63.1% of the educators being full time, students are certain to get lots of face time with teachers. Get a better idea of what campus life at WUSTL is really like by seeing a few campus videos. It is hard to beat Columbia University in the City of New York if you want to pursue Anthropology as a major. Students who complete this degree state that they receive average early career earnings of $46,641 and mid-career earnings of $79,880. With over 20,000 students, this school is among the largest schools in the country. This school does not require freshmen to live on-campus. With a low net price and fantastic academic programs, Columbia University in the City of New York is a good investment, attaining a rank of #44 in New York. Get an idea of what student life at Columbia is like by viewing some campus videos. Yale University is among your top options if you want to study Anthropology. Students from the anthropology major at Yale University get 39.1% above the average college grad with the same degree. The setting in a large urban center is great for students seeking out considerable options for social networking, excitement, and exploration. University of Michigan - Ann Arbor is among your best bets if you're planning on studying Anthropology. Students from the anthropology major at University of Michigan - Ann Arbor get 16.9% above the average graduate with the same degree. With over 20,000 undergraduates, University of Michigan - Ann Arbor is among the biggest schools in the U.S..
About 27.0% of U of Michigan applicants send their SAT scores, which average about 1,405. U of Michigan features a high performing women's softball team. If you are considering finding out more, you can see all of University of Michigan - Ann Arbor's rankings here. Any student who is interested in Anthropology needs to check out Harvard University. Anthropology majors from Harvard University get a earnings boost of approximately 39.0% over the average earnings of anthropology majors. This school is one of the largest schools in Massachusetts. Roughly 86.6% of the professors at this school are full-time and have regular office hours, so they will be more available to help. International students comprise 23.0% of the people at Harvard University. Find out about what student life at Harvard is really like by watching a few campus videos. It is hard to beat University of California - Los Angeles if you wish to pursue Anthropology as a major. Graduates of the anthropology program make an average of $37,010 in their early career salary and $64,463 in their mid-career salary. The setting in an important urban center is great for young people seeking out considerable opportunities for social networking, adventure, and exploration. University of California - Riverside is a great choice for students pursuing an Anthropology degree. In addition to its bachelor's programs, University of California - Riverside offers graduate degrees in Anthropology. This school is one of the largest schools in California. This school does not require freshmen to live on-campus. This school is well-known for its support of military personnel and is the 348 best in the country for veterans. For additional information, check out the college scorecard. Any student pursuing a degree in Anthropology has to check out Brown University. Brown University offers graduate degrees in anthropology for those interested in an advanced degree. Situated in Providence, Rhode Island, this school is a logical choice for students who enjoy the thrills of a large city. Roughly 49.0% of students submit ACT scores, with the average score being in the 32 range. With 85.6% of the educators working full time, students are sure to get plenty of face time with teachers. Videos from Brown can be a good way to explore university. It's hard to beat University of California - Berkeley if you want to pursue Anthropology as a major. Graduates of the anthropology program report average early career wages of $42,037 and mid-career wages of $55,993. University of California - Berkeley has one of the largest student bodies in California. Every student who is interested in Anthropology has to look into University of Washington - Seattle Campus. University of Washington - Seattle Campus anthropology students make 12.6% more than the average anthropology student. University of Washington - Seattle Campus is among the largest schools in Washington.